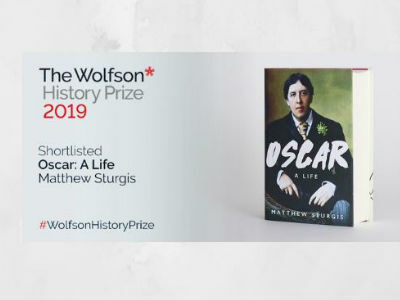 Matthew Sturgis’ major new biography on Oscar Wilde has been shortlisted for the Wolfson History Prize 2019. OSCAR: A LIFE by Matthew Sturgis, published by Head of Zeus on 4th October 2018, is the only work by a non-academic historian to be shortlisted. It is the first major biography of Oscar Wilde in thirty years. Offering a wealth of new material to create a rich and moving portrait of Wilde and the era in which he lived, Oscar: A Life demonstrates why Wilde is as relevant today as ever and presents him as an inspiration to all those who seek to challenge convention. The full announcement is available here . The Wolfson History Prize is awarded annually to promote and recognise outstanding history written for a general audience. First awarded in 1972, it remains a beacon of the best historical writing being produced in the UK, reflecting qualities of both readability and excellence in writing and research. Books are judged on the extent to which they are carefully researched, well-written and accessible to the non-specialist reader.